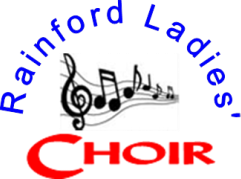 Rainford Ladies' Choir (St Helens, Merseyside) is a warm and friendly group of singers who enjoy meeting each week to sing and socialise. The choir currently has around 48 members, with Martin Weston as musical director. The choir's repertoire is wide and varied, with many songs taken from shows and films. We also sing sacred, gospel, jazz, pop and world music, with the odd novelty number thrown in! The choir performs at many events in Lancashire and Merseyside, including two main concerts each year at Rainford Parish Hall, plus charity events and private functions. The choir began in the late 1980s as an ecumenical choir, and retains strong links with local churches, especially All Saints' Parish Church, where we rehearse each week. Read more about the choir's history. The choir also performs at weddings and funerals held at All Saints', Rainford, at Lowe House in St Helens and further afield when asked. ​Also available for other events. What we sing (sample) See recordings from our concerts by clicking here. ​Events can be viewed at the top of this page and on the repertoire page. ​The choir is full at the moment but please contact us if you are interested.